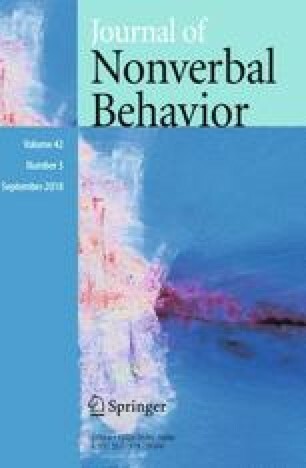 Using one of the key bibliometric methods, namely the index of citations, from a comprehensive multidisciplinary bibliographic electronic database, Web of Science, this article provides a circumscribed descriptive analysis of 1000 most-cited papers in the research field of visible nonverbal behavior. Using this method, we outline the most influential topics and research programs, and sketch the development of relevant features over the years. Topics include nonverbal behavior, facial expression, personal space, gesture, thin slices, and others, but exclude vocal or auditory cues. The results show that the 1000 most cited papers on visible nonverbal behavior emerged in the 1960s, and peaked in 2008. Revealing the strong interdisciplinary nature of the field, the 1000 papers come from 297 journals. Further, 33 journals had 7 or more papers, contributing to more than 50% (n = 515) of the 1000 most cited papers. The most cited paper (Whalen et al. in Emotion 1(1):70–83, 2001. https://doi.org/10.1037/0033-2909.111.2.256, a neuroscience paper) is cited 1341 times, and Paul Ekman has the highest number of papers (17) as first or last author. Results are compared with two other corpora of papers (i.e., a random sample control group and a current papers group) to provide a more thorough understanding of possible future directions in visible nonverbal behavior. Results differ from those that emerge from other citation indexes and are intended to give a flavor of key peer reviewed papers (excluding books and chapters) contributing to the development of scientific knowledge on visible nonverbal behavior. The online version of this article ( https://doi.org/10.1007/s10919-018-0280-9) contains supplementary material, which is available to authorized users. A correction to this article is available online at https://doi.org/10.1007/s10919-018-0290-7. The authors would like to thank Judith Hall and Howard S. Friedman, as well as the anonymous reviewers, for their constructive comments on earlier versions of this manuscript. The authors would also like to thank the Fonds de Recherche du Québec—Société et Culture (FRQSC) for a doctoral research scholarship awarded to Vincent Denault. Clarivate Analytics. (2017). Web of science. Retrieved from https://clarivate.com/products/web-of-science/. King, C. (2017). Web of Science: 1 billion cited references and counting. Retrieved from http://stateofinnovation.com/web-of-science-1-billion-cited-references-and-counting. UNESCO (2015). UNESCO Science report: Towards 2030. Retrieved from http://en.unesco.org/unesco_science_report.